What do you get for the price of a new machine? Pricing for all our machines is “turnkey”, meaning that everything needed to become operational is included, the cost of the machine, installation, training and a full year parts and labor warranty, including software updates and lifetime remote diagnostics and support*, which enables instant technical support and virtually eliminates the need for on-site technical support visits. Home base for our sales, phone & remote support and parts and materials inventory is Boulder, Colorado. We have technicians based in many locations around the United States so that someone is always nearby for the few service calls that actually require a technician’s visit. How long does it take to get a new machine? Delivery can be made in as little as 5 business days and the machine can be operational in less than 14 days in most cases. How much waste return material is produced per letter? 1/4 inch or the width of a cut for our machines. Compare that to our competitors machines that waste multiple inches of return material for each new letter setup, leading to higher operational costs. How long does it take to bend a letter? The ChannelBender Series machines consistently have the fastest bend time when compared to our nearest competitors’ machine. For example, an 18″ flanged channel letter takes an average of only 3′:30″-3′:45″ to flange, notch and bend. In addition, the output from our ChannelBender Series machines is far superior in both quality and accuracy, thereby slashing labor costs. What’s the largest letter that can be produced? Height is essentially limitless or as tall as you’ll ever need. Depth of letters varies depending on machine and materials used, but ranges are from 1 inch to 10 inches. What’s the minumum serif size that can be produced on the SCB? If you don’t see your question answered above, give us a call at 303.798.7110, ext. 203 or send an email. We began developing our line of Trimless channel letter solutions after being approached by several customers who were interested in solving common problems with trim cap. Problems like fading, cracking, peeling, matching colors and of course, higher labor costs. To facilitate a better understanding of our Trimless channel letter solutions, here are answers to some of the more frequently asked questions we receive. What exactly is a trimless channel letter? Trimless channel letters entirely do away with the trim cap that traditional channel letters use to hold the face of the letter on, producing a much cleaner, more visually appealing appearance. 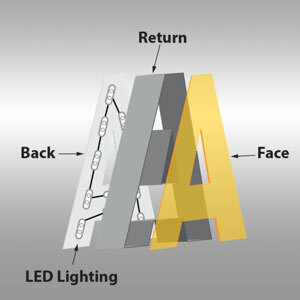 Notice, in the image, that there is no trim cap holding the face of the letter on. Why would you want to produce Trimless channel letters? Trimless channel letters are intended to be offered as a much more attractive, aesthetically pleasing, premium product for a premium price, thereby delivering a greater profit margin. In addition to selling these attractive, high-quality letters for a premium, customers will save money by eliminating the labor and material required by the trim cap process. Plus, Trimless eliminates many common problems associated with trim cap like fading, cracking, peeling, and matching colors. LetterForm is the newest innovation in our line of Trimless channel letter coil. So innovative in fact, it was awarded an Innovation Award at the 2016 ISA Sign Expo. It is a pre-painted aluminum material measuring .040” in thickness. Bonded to the interior surface are PVC strips which are used for attaching faces with adhesive and backs using our patented Easy Clips. LetterForm is sturdy yet just flexible enough to allow customers to produce high quality, exceptionally detailed Trimless signage. This innovative, patented coil saves customers time and money by entirely eliminating trim cap from the fabrication process. To find out more about features and view detailed drawings, please see Letterform. Do I have to have one of your machines to produce trimless channel letters? While some companies have developed custom fabricating techniques done by hand, SDS Automation is the only company with the patented materials, equipment and process to quickly and efficiently fabricate Trimless® channel letters on an automated channel letter bender. We like to think of LiquiForm as the future of channel letters, here today. LiquiForm is a poured resin process that allows for the fabrication of low-profile, high-style letters with outstanding illumination properties, ideal for interior signage. Since this is an entirely new channel letter process, SDS Automation is offering classes in LiquiForm fabrication, limited to owners of our machines. © 2019 by SDS Automation. All rights reserved.